Integrated 48 cm / 19” capacitive touchscreen with FitTouch Technology for intuitive performance. Custom app interface designed specifically for fitness offers users easy access to social media and web content. WiFi connectivity for use with app interface and integrated Matrix Asset Management system. Custom interface configuration for personalized communication with users. Single-point user sign-in for a seamless personal experience. Featured on our own 7xe-sequence 41 cm / 16" touchscreen display with FitTouch Technology offers intuitive operation. interface inspires customers at all ranges and gives you intuitive operation. Our impact absorption technique provides ultimate experience for any consumers. Intuitive LED console display. Compatible with iPod for charging. Integrated 3-speed personal fan. WiFi enabled for use with Matrix Asset Management system. Integrated 41 cm / 16” class touchscreen display with FitTouch Technology for intuitive performance. Vista Clear Television Technology -- the most vibrant picture quality in the industry. Compatible with immersive Virtual Active programming. Ultimate Deck System for superior performance and durability. LED console display is easily navigated by users of all experience levels. Ultimate Deck System for superior performance and durability. Low 19 cm / 7.5" step-on height for easy accessibility. 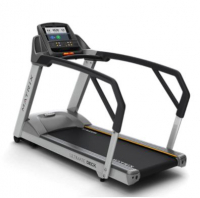 Vibrant picture quality is a significant feature of the 3xH treadmill. Brought to you by Vista Clear Television Technology, it is also industry compatible with Immersive Virtual Active Programming. In order to provide secure entry and exit, extended handrails with angled grips are integral to the unit's design. 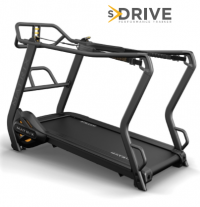 The Ultimate Deck System ensures the superior performance and durability of the 3xH treadmill. Our unique design includes a sturdy, built-in bar that simulates sled pushing and pulling without needing the space to use a traditional sled. Multiple sled brake settings help coaches and trainers develop precise progression programs to maximize results.